The A.O.F.B. commissioned pennants made of a hard wearing orange, canvas like, material designed to be flown from cars and cycles . The car pennants were 12 x 6 inches ( 30 x 15 cm ) priced at 2/ 9 and the cycle pennant 8 x 4.5 inches ( 20 x 11 cm ) priced at 2/-. They also commissioned a yacht burgee in the same material that measured 26 x 12 inches ( 65 x 30 cm ) priced at 6/6 . There is a yacht burgee that has survived the ravages of time although it has seen better days. 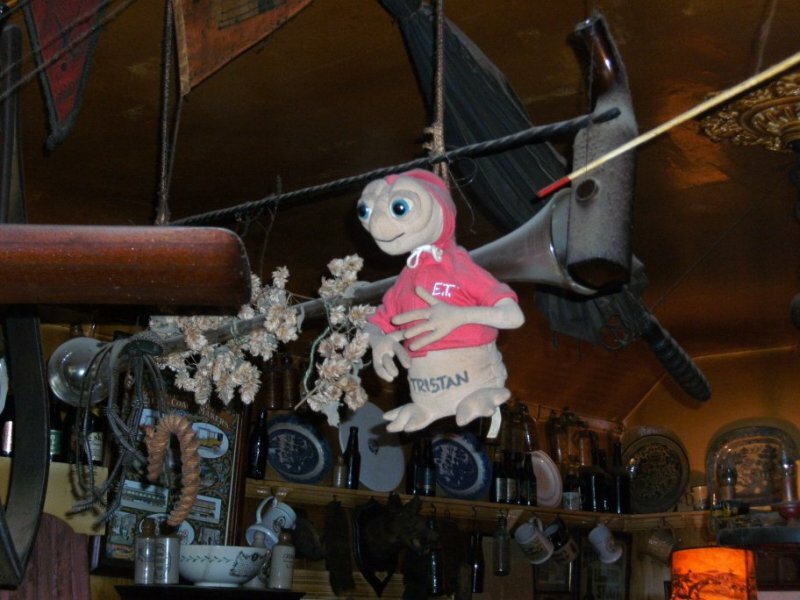 FOFB Dave Muggleton informed that there was a pennant in the rafters of a pub on the outskirts of Bognor Regis, namely the Murrell Arms in Barnham. After an outing to the Swan Inn at Fittleworth , some of the FOFB's set out to see if we could find the Murrell Arms. 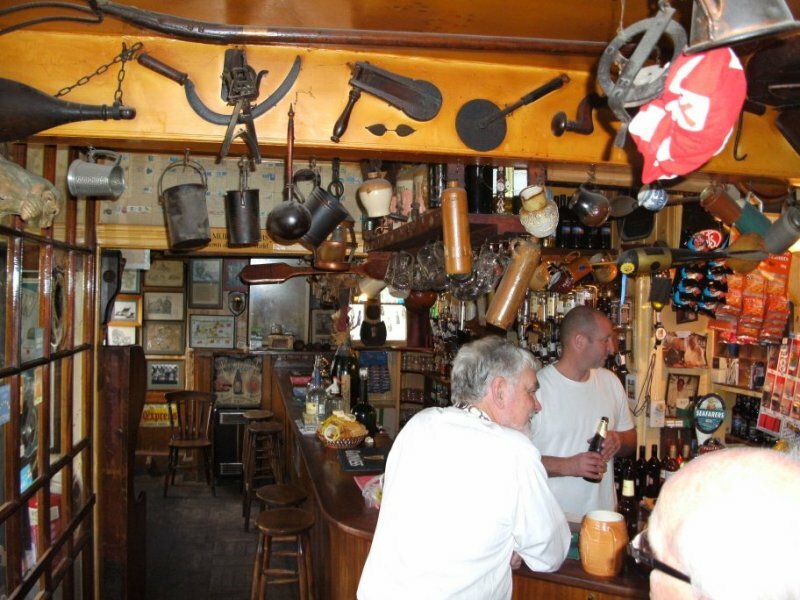 What a charming pub, walls and ceilings are adorned with a cornucopia of local items and breweriana from over many decades - and there in the middle of the ceiling the A.O.F.B. yacht burgee. The manageress has run the pub for well over 40 years and it has been there as long as she can remember, and by the look of it hasn't been cleaned during that time and it is probably being held together by the collective dirt, grime, and cigarette smoke from over the years - there are a couple of small holes now visible. After a health scare I believe that she is planning on retiring but handing the pub over to a family member. If you get the chance do pop in the Murrell Arms, there's a warm welcome to be had as well as the sight of the burgee which may be the last one surviving. 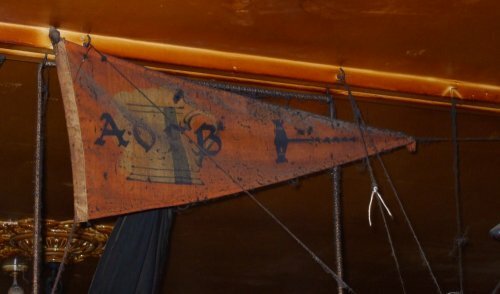 The AOFB pennant is just visible slightly off centre, top of the picture. Another curiosity at the Murrell Arms is a traditional game of Ringing the Bull - not easy but fun. Here's a video of FOFB Brian having a go.